TKTD models as well as other mechanistic effect models can be applied for a variety of questions in environmental risk assessment of chemicals. For example there is a lot of interest in the prediction of effects from fluctuating or pulsed exposure to pollutants (also referred to as intermittent, episodic or time-variable exposure). 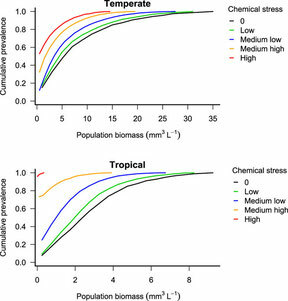 Population biomass (mm3 L−1) for Temperate and Tropical scenarios. Ashauer & Brown (2013). Highly time-variable exposure to chemicals - toward an assessment strategy. Integrated Environmental Assessment and Management (link to paper at IEAM). Abstract: Organisms in the environment experience fluctuating, pulsed, or intermittent exposure to pollutants. Accounting for effects of such exposures is an important challenge for environmental risk assessment, particularly given the simplified design of standard ecotoxicity tests. Dynamic simulation using toxicokinetic-toxicodynamic (TK-TD) models describes the processes that link exposure with effects in an organism and provides a basis for extrapolation to a range of exposure scenarios. In so doing, TK-TD modeling makes the risk assessment more robust and aids use and interpretation of experimental data. Toxicokinetic-toxicodynamic models are well-developed for predicting survival of individual organisms and are increasingly applied to sublethal endpoints. In the latter case particularly, linkage to individual-based models (IBMs) allows extrapolation to population level as well as accounting for differences in effects of toxicant exposure at different stages in the life cycle. Extrapolation between species remains an important constraint because there is currently no systematic understanding of species traits that cause differences in the relevant processes. 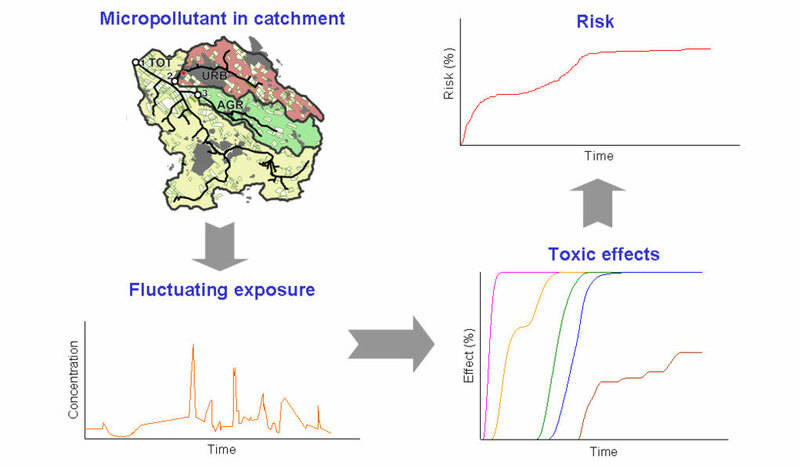 Toxicokinetic-toxicodynamic models allow interrogation of exposure profiles to determine intrinsic toxicity potential rather than using absolute maximum concentrations or time-weighted averages as surrogates. A decision scheme is proposed to guide selection of risk assessment approaches using dose extrapolation based on Haber's Law, TK-TD models, and/or IBMs depending on the nature of toxic effect and timing in relation to life history. Using toxicokinetic-toxicodynamic modeling as an acute risk assessment refinement approach in vertebrate ecological risk assessment. Recent guidance identified toxicokinetic-toxicodynamic (TK-TD) modeling as a relevant approach for risk assessment refinement. Yet, its added value compared to other refinement options is not detailed, and how to conduct the modeling appropriately is not explained. This case study addresses these issues through 2 examples of individual-level risk assessment for 2 hypothetical plant protection products: 1) evaluating the risk for small granivorous birds and small omnivorous mammals of a single application, as a seed treatment in winter cereals, and 2) evaluating the risk for fish after a pulsed treatment in the edge-of-field zone. Using acute test data, we conducted the first tier risk assessment as defined in the European Food Safety Authority (EFSA) guidance. When first tier risk assessment highlighted a concern, refinement options were discussed. Cases where the use of models should be preferred over other existing refinement approaches were highlighted. We then practically conducted the risk assessment refinement by using 2 different models as examples. In example 1, a TK model accounting for toxicokinetics and relevant feeding patterns in the skylark and in the wood mouse was used to predict internal doses of the hypothetical active ingredient in individuals, based on relevant feeding patterns in an in-crop situation, and identify the residue levels leading to mortality. In example 2, a TK-TD model accounting for toxicokinetics, toxicodynamics, and relevant exposure patterns in the fathead minnow was used to predict the time-course of fish survival for relevant FOCUS SW exposure scenarios and identify which scenarios might lead to mortality. Models were calibrated using available standard data and implemented to simulate the time-course of internal dose of active ingredient or survival for different exposure scenarios. Simulation results were discussed and used to derive the risk assessment refinement endpoints used for decision. Finally, we compared the “classical” risk assessment approach with the model-based approach. These comparisons showed that TK and TK-TD models can bring more realism to the risk assessment through the possibility to study realistic exposure scenarios and to simulate relevant mechanisms of effects (including delayed toxicity and recovery). Noticeably, using TK-TD models is currently the most relevant way to directly connect realistic exposure patterns to effects. We conclude with recommendations on how to properly use TK and TK-TD model in acute risk assessment for vertebrates. In the study "A method to predict and understand fish survival under dynamic chemical stress using standard ecotoxicity data" we apply TKTD modelling to a problem in pesticide risk assessment. The abstract is provided below and the study is available at the journal's website (open access). Ashauer R, Wittmer I, Stamm C and Escher BI (2011): Environmental Risk Assessment of Fluctuating Diazinon Concentrations in an Urban and Agricultural Catchment Using Toxicokinetic–Toxicodynamic Modeling. Environmental Science & Technology, 45 (22), 9783-9792. (link at journal here).